Preparing your own garage sale is often a daunting task. It’s also difficult for potential buyers to discover your merchandise. Design an experience that makes it easier for sellers to intelligently inventory their goods, and helps bargain hunters find the needle in a haystack. What is a garage sale? A garage sale (also known as moving sale or yard sale) is an informal, irregularly scheduled event for the sale of used goods or unwanted items from the household with the home owners conducting the sale. People want to save money by selling and buying used items. What's the best way? Based on sellers and buyers' goal, I decided to expand the definition of garage sale to selling/buying activity to save money within local communities. What people want from garage sales is to raise funds by selling. As alternatives, people use craigslist and other mobile applications to post items and arrange purchases. Although these services are better alternatives than garage sale, there are still problems. How to solve all of these problems, so people can enjoy buying/selling experience, while saving money for the future. Let's move on to research part to get inspired! These are the all variation of craigslist, and these applications are slightly better in terms of better interface and gps data. But these apps still don't really solve following problems, which are hurdles in selling and buying used items. 1. Find a potential buyer at the right timing. 2. Scheduling between buyers/sellers is not easy. 6. Why my feed of application are not filled with items I want to purchase? 8. Can an inventory of selling items be automatically updated? The followed research will cover how to solve each of the problems respectively by searching through the application on the market as well as brainstorming. These are types of applications that provides pickup/delivery experience to customer. Instacart purchases from local grocery stores and deliver it to home in a schedule time of the day with a little charge. Move Loots pickup used furnitures to their warehouse and organize all sale with 50% of service charge. Shyp offers a pickup service for shipping a package. With all these concept in minds, now I know how to solve problems for solving scheduling, pickup/delivery items. Build a service that collects items from seller's home with a little service charge and provide a delivery to buyers(e-payment). This will be the solution to problem 2 ~ 5 ( scheduling, pickup, carry and cash).Now the entire users pool is a lot bigger as people are not limited by location in the city. What would be the best way to find potential buyers for items I am selling?If sellers can find potential buyers for their selling goods, their life would be a lot simper. To figure it out, I researched on social media as these are the (online) places that filled with news, information that are relevant and tailored to individuals. And how do they suggest new friends/following to add? Based on your data( profile, school, friends etc). By applying the same logic, it would help buyers find potential users. Why don’t my feed display all items that I previously searched, and update the searched result automatically whenever users are back to the application? I think my feed for item should be filled with thing I am looking to buy, not random items in reversed chronological order. Also, it would be nice if I can get rid of certain items that I don’t want to see it anymore. This will be the solution to problem 6-7. From extensive researches on applications on the markets, I was able to define few features for the project. For those problems which haven't been covered from the research, I did brainstorming to solve problems by myself. And here is all features. The service will pickup selling items from seller's home and store them in own warehouse. ->When a buyer made a purchase, the seller will get paid once the package is delivered. -> The service will suggest a reasonable selling price for items that have not been sold over 10 days. ->After 30 days, seller can either choose to donate items, or get them back. 1. Following/ Follower relationship based on the keywords users selected when they register. -> These keywords could indicate your interest or social status. And by following people who share same interest/social status, buyers will get the list of items directly from followings, and another list of items that your following like. 2. Display multiple search results and the list remains and is updated automatically. -> For instance, if you searched "bike" and "helmet" respectively, your feed is now covered with bike and helmet in reversed chronological order. If you want to add more search query, you can just search again. 3. Since all items are now stored in the warehouse from seller's home, the mediator can offer a delivery to its buyers. -> Stop dealing with irresponsible users. Loop is the most smartest way to buy and sell used items online in New York city. Loop pickup items from sellers' home, and store it in its warehouse and provide a seamless experience for buyers. Loop also connects users with similar social status and interest and now matching with potential buyers has never been this easy. Currently, Loop only serves New York city area. Loop is planning to expand its service to other area. No more hassle for buying and selling used goods online/offline. What you need to do sell is to take pictures, add details and submit it to the loop market. 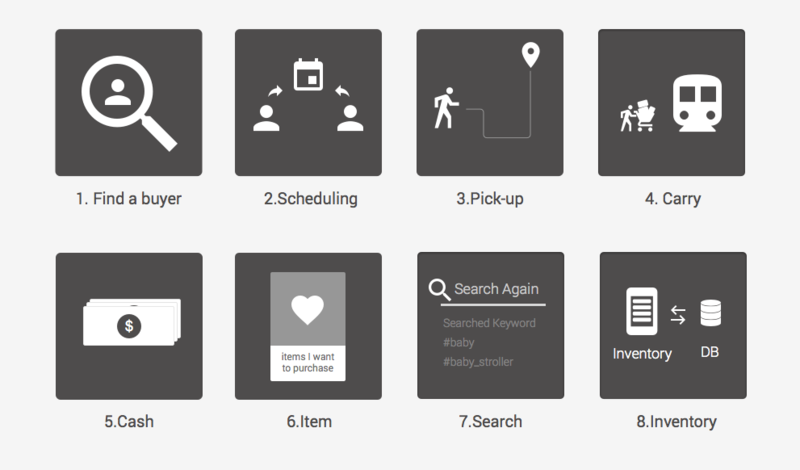 Then, Loop concierge will schedule to pick your items up. What’s next? Wait until your item is sold! Don’t even lift a finger to sell. In the other side, with the loop, purchasing used items becomes an addiction as it offers delivery. And free shipping over $25 dollars. Now you don’t have to worry about renting a car, scheduling with buyers and preparing cash. click and shop. Period. Keep informed with all items news in a page and take an action with a single click. Never miss a thing about your items. Each account holder will have a seller account and buyer account. Once they create an account, both seller and buyer will be activated at the same time. The account is divided to provide focused experience on different activities.